Jan Friederichs, research assistant and PhD student at the Institute for Automotive Engineering (IKA) and RWTH Aachen University, fills us in about his work on how dynamic tire footprints can help enhance and validate tire simulation. Tell us about your research into dynamic tire footprints. I work in the chassis department of the tire technology division and I’m currently working on a public project funded by the Deutsche Forschungsgemeinschaft (‘German Research Organisation’). The aim of the project is to provide fundamental research for the development of more permanent carriageways through a coupled consideration of the road-tire-vehicle-system. In contrast to chassis development, where forces and moments from the tire to the chassis are taken into consideration, here, the interaction between tires and road surfaces is investigated. Therefore, we need a tire model which has a validated tire contact patch behaviour over a full spectrum of driving manoeuvres. In what ways have you found existing models to be lacking and how do dynamic tire footprints improve this? At the Institute for Automotive Engineering (ika), we have access to a large variety of tire test rigs to investigate tire stiffness, transient behaviour, forces and moments during handling manoeuvres and more. With our own measured and validated data, we are able to parametrise detailed physical tire models such as FTire. For the parametrisation of these simulation models, we also use a capacitive pressure imaging sensor which generates data about the local ground pressure distribution at different wheel loads and camber angles for a non-rolling tire. The data provides the approximate tire contact patch dimensions for the tire model. Nevertheless, these static measurements cannot indicate local shear stress or ground pressure distribution for a tire rolling on an uneven road surface. In addition to the total force, FTire simulation models are also able to output the vertical and horizontal forces in the tire contact patch. In previous studies, we could not validate these forces to the level of detail we wanted, since reference data was missing. The measurement of dynamic footprints now adds a further level of detail for the existing tire model. By comparing simulation and measurement data, the significance of the simulation models in the discretisation of the force distribution in the tire contact patch can be evaluated. Only by validating this new discretisation stage will it be possible to execute driving dynamics simulations while simultaneously evaluating statements about load conditions on the road surface. Coefficients of friction and rolling resistance can now be investigated, even down to a multi-dimensional load of individual grains of asphalt. What have been the key challenges and how have you overcome these? The first key challenge has been to identify an adequate measuring system that is able to measure shear stresses and ground pressures of a rolling tire. Once we found that, we had to also implement it into a testing area. The answer turned out to be a force-matrix sensor made by A&D Europe for outdoor use on the road. It consists of 40 sensor pins aligned in an array. The pins are equipped with strain gauges and measure the reactive force from the road surface in three directions. The Aldenhoven Testing Center, which is located near the Institute, provided the infrastructure to install the force-matrix-sensor. The second key challenge has been the measurement at constant operating tire conditions. In this project, the mobile tire test rig FaReP was used. The semitrailer, which was designed to test tires on real roads, is owned and operated by ika and fka. The most important part of the mobile tire test rig is the wheel guidance unit in the middle part of the trailer. 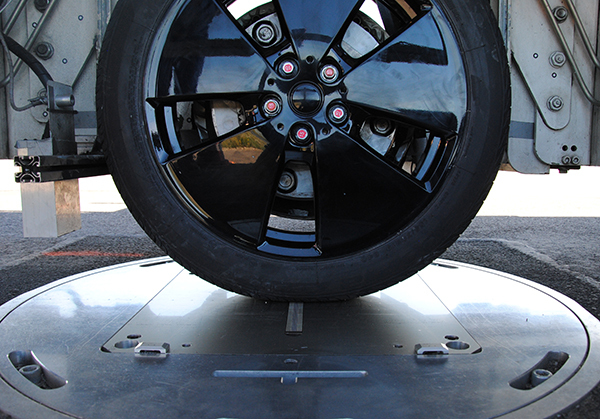 It allows for independent application of set constant load conditions to the tire, as well as the measurement of the wheel forces when the rig crosses the sensor on the road. All this data helps the validation of the sensor data. In my presentation, I will present the results of the dynamic footprint measurements of a commercial tire, the validation and adaption of the corresponding tire model with respect to ground pressure and shear stress distribution. What’s next for this research? The original and enhanced tire model will be used for a full vehicle simulation on ergodic substitute roads, which consist of digitalised road surface samples without repeating vertical excitations. An effect analysis on the tire model’s level of detail will allow us to draw conclusions about the importance of adequate tire models for simulative road load investigations. Furthermore, we will introduce methods for the identification of road load peaks in correlation to tire contact patch behaviour. 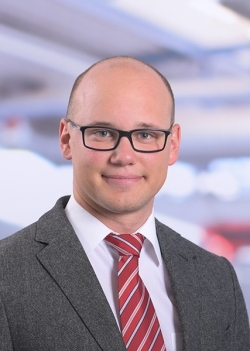 Jan Friederichs will give a presentation titled Dynamic tire footprint measurements to enhance and validate tire simulation at the Tire Technology Expo Conference. Click here to book your delegate pass.